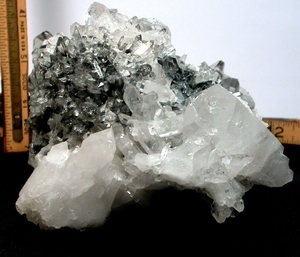 5" wide x 7-1/2" long x 3-1/2" high Arkansas cluster has a squeaky-clean grey sandstone base supporting a range of rarities from a tiny crystal cross, to frills of multiple, doubly-terminated white tabular faden crystals, to a 1-1/2"x 4" doubly-terminated rainbow crystal bedizened with barnacles and penetrator crystals. Record keepers for you, too. A+ grade super clear very dark blue phantom crystals [black manganese] begin at 3/8" and go up to 2" long with a rare iris. One crystal has a conchoidal fracture and so is less exactly and not apparently one face; one penetrates the space between two tips of others, extending to form a 1-1/2" alpine bridge - so much to grasp here! Weight of the matrix has made an accommodating price for this luminous cluster.